By 1970 Galliard was recognized as one of the new-wave of progressive rock bands and following the impact of the first album went back into the studios in late 1969 to commence work on the next album 'New Dawn'. John Smith the original sax player had become increasingly unreliable and had been replaced by a tremendous new player friend of Dave's, Lyle Jenkins. The only trouble with having such a brilliant brass section was that it was being eyed by other bands of much higher recognition than Galliard at the time. The second album, 'New Dawn', was recorded in the Beatles' legendary Abbey Road Number 2 studio. Surrounded by an array of extra instruments (including the famous Mellotron from Strawberry Fields), the band included supplemented brass sections, sitars, keyboards, sine-wave generators, accordion, harpsichord and other creative inputs that meant it took longer to record than the first album. The album, again produced by Phil Wainman, was far more ambitious and polished than the first album and the band had finally found its own sound. The first two tracks; the classic 'New Dawn Breaking' written by Geoff with a great brass arrangement by Dave Caswell and a stunning free-form sax-solo from Lyle Jenkins; and 'Premonition', an instrumental written by Dave, were both finished by February 1970. The third track with them playing trumpet and sax, 'Your Mind's Eye', was completed by March. Then, out of the blue, both Dave and Lyle were poached by 'The Keef Hartley Band'. Understandable now as Keef Hartley was an established professional London band with a big following, but at the time it was a massive blow and it was hard to replace them. Keef Hartley subsequently lost Dave and Lyle to 'Ashton Gardner & Dyke'. Dave and Lyle played together in various bands following AG&D and Dave went on to play with some very high profile bands and artists such as The Who, Elkie Brooks, Rick Wakeman, Randy Crawford, The Yellowjackets, Paul McCartney and many others. Undeterred, the remaining Galliard line-up was determined to get the album finished. John Morton, a local trombone player and arranger, and a friend of Geoff's, was the key to providing the musicians and working alongside Geoff on the arrangements for the remaining tracks of New Dawn. He also contributed as a co-writer with Geoff on a couple of new songs for the album. Galliard were back in the studio in May 1970 with a new line-up to include John Hughes brass arranger and trombone/keyboards, Tony Roberts (sax), and Harry Becket - a session trumpeter to complete the album. The first track, 'Winter-Spring-Summer' with this ensemble was recorded on the 3rd May 1970 with a stunning flugelhorn solo by Harry Becket, followed by one of Geoff's favorite tracks, 'Open Up Your Mind' on the 31st May. The album was completed in July and released in September 1970. John Peel had a major radio-show at the time and invited Galliard to appear live twice earlier in the year when Dave and Lyle were still with the band. The recordings are still available as bootlegs and show how exciting the band could be in a live setting. The band was then a 6-piece with John Morton on trombone and Bob Rae on sax/trumpet. 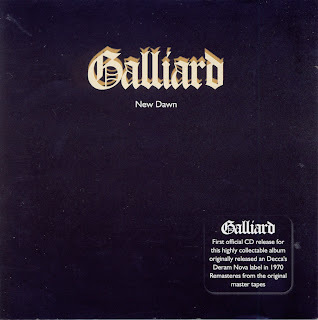 1970 was a busy year for Galliard with lots of live performances plus a gig in June at the legendary 'Festival of The Midnight Sun' at the Mantorps Racing Circuit in Sweden. This gig though was played as a quartet with no brass section as the guys couldn't make it and it became clear to the band that the cost of touring with a brass section, plus the unreliability of the players and the changes of personnel made it necessary to revert back to the four-piece guitars, bass and drums line-up. This was the line-up that went, inexplicably, to the Belgian Congo in November 1971 to play for Mobutu's presidential celebrations - and came back alive! Losing the brass section was not a detrimental thing for Galliard who continued to thrive and tour with the quartet line-up. Richard still played sitar and Geoff supplemented with keyboards as synthesizers slowly started to creep into rock group line-ups. Phil Wainman meantime, with his pop successes, wanted to record Galliard under a different name. The same line-up released a single in 1971 under the name of 'Helicopter' on Phil's own 'Maple Annie' label with a song written by Geoff entitled 'I Belong To Yesterday' which featured Richard on his legendary sitar. The band unfortunately by then had lost its way. The lack of success at the time of the albums had disheartened the guys and Les decided to quit. Geoff had by then moved on from progressive rock to more commercial music and was attracted to the keyboards and the possibilities that they offered, especially the new electronic samplers and other synthesizers. 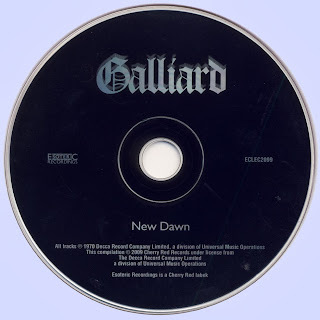 It was really the end of the road for Galliard as Geoff's new songs moved the band in a new direction towards funk/jazz black-American influenced music that got Geoff and Andy back to their R&B/Blues roots, which was not the direction that all the band wanted to go in. It also got the band more work as they switched to the Birmingham-based Fewtrell/Tully agency and started to work in more night clubs than colleges. Richard Pannell eventually left in 1973 and joined E.L.O. as their permanent sound engineer. Les Podraza moved on as he wasn't interested in the new music, to be replaced firstly by the late Fred Woolley, followed by Steve James, and then another Geoff drummer discovery, Mel Gaynor (Carl Palmer being the first). Mel later went on to fame with Simple Minds! Lyle Jenkins is still playing and runs a jazz club and teaches sax/woodwinds in Essex. Dave Caswell is retired but still active with local bands in Dorset. He commutes to Germany each year for serious jazz gigs. Geoff's next band to take the stage and make an impact in Birmingham and the recording scene was 'Muscles' who became Birmingham's answer to 'Level 42', but that's another story!